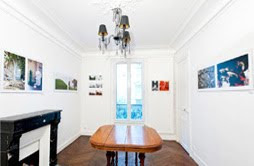 Mariska Hammoudi is the owner of a gallery in the 16eme arrondissement of Paris. It's a very unusual gallery but like most is run by a person passionate about the arts. Ms Hammoudi is a graduate of the Beaux Arts. Her facination is with the history of arts and her passion is to promote and develop her gallery and diffuse an awareness of her artists among the world of collectors. She only exhibits figurative art and has a facination for the renaissance though she appreciates many other forms of representational style. In france, art collectors are referred to as Les Amateurs d'art. The term comes from a french magazine of the same name and although the magazine ceased after the death of Michel Boutin, the director in the early 1990's, the term is still used today for those who search for and collect the work of artists in France. So don't be confused if you hear the expression being used to describe you. So what makes this gallery different to others? It's quiet simply the very personal nature of it. You won't find this gallery behind a shop window or see signs directing you to it. You have to know of it. To have been introduced or invited to attend. Her gallery is in her apartment and effectively all of the space within, has been dedicated to the exhibition of works of art. This is a sacrifice in a city where space is at a premium but as Ms Hamoudi says, the art on the walls is the art which she chooses to live with. The process of choosing an artist is also very personal. To exhibit in her space a fusion between the gallerist and the artist must take place. Together they dicuss each others lives and interests and slowly come to a conclusion resulting in a theme for the exhibiton. It is a mutual conclusion and in the case of the current exhibition which is by Yoomi Ha, a Korean artist and the first non french and autodidact artist to have exhibited here, the theme is secrets. When you look around the room you wonder how these images could refer to secrets in the life of this young gallerist but she assures me that there are elements in each piece which profoundly remind her of events in her life and the world around her. When discussing the subject she mentioned that to French people and Europeans in general, secrets are something worth learning and even hunting for but most especially they are worth keeping. What is the future for this gallery? Her intention is to enlarge it but to never have a gallery which has a shop window or which doesn't look like a persons home. Her reasons are simple and I agree with them. Typcially a gallery is an artificial impersonal, sterile space, often with high ceilings and very strong lighting. 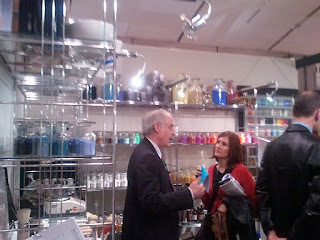 They can alienate visitors who often cannot imagine the works on display, ever fitting into their home. Here though you can see how, even a large painting (and there are sev eral among her private collection) can easily become a part of the living experience of a typical home, even on the scale of an average Paris apartment. So how does an Amateur des Arts visit this space if it does not have a typical shop window? 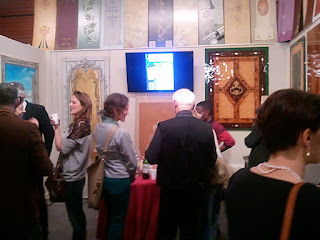 To visit a vernissage requires an invitation or to go with someone who has one. Alternately you may visit at any other time by making an appointment. She is happy to show interested people around the space and discuss the works on show. 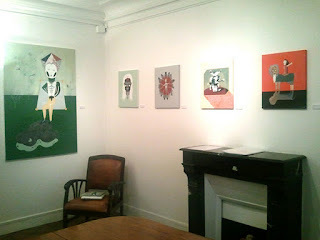 The current exhibition ends 16 décembre 2011. After the vernissage at the gallery of Yin Atelier on the left bank of Paris in Saint-Germain-des-Pres. Myself, Jenny Page, Alex Novak and our wine expert, Olivier enjoyed a glass of wine and delicious meal at Willies Wine Bar on rue des Petites-Champs. Thanks to Alex for being such a great host. The bar is full of custom designed posters. Each one painted by an artist who visited the bar at some stage. They have great taste in artists as all the images are really inspiring. The posters can be collected by guests of the restaurant and seem to be very popular. Fra Angelico at the Musee Jacquemart-Andre, Paris. This week I had the pleasure of visiting the musée Jacquemart-André. It's my favorite art museum in Paris. There is a permanent exhibition which spans many genres and there is the curated exhibition. 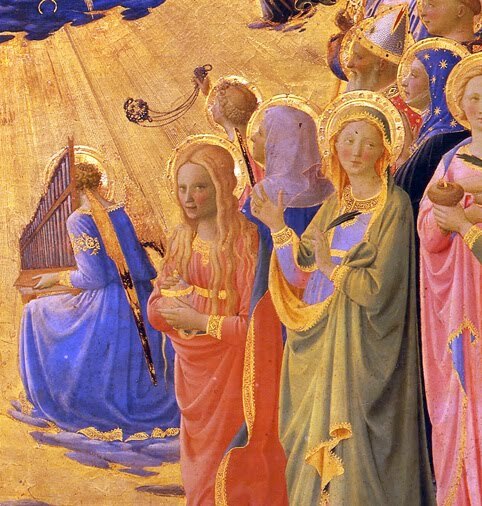 This time, it is of the late Gothic or early Renaissance paintings of Fra Angelico. As his name suggests, the works are truely angelic, especially when compared to other artists at this time. A detail from the crowning of the Virgin. Born in 1395. From the age of 17 he was already recognised as an illuminator/illustrator of books, so he could read as well as paint. He became a friar in a Dominican order based in Tuscany. In 1436 he moved to the nearby town of Florence which was the centre of artistic activity at the time. It was here that he came under the influience of the Medici family. He had an enormous effect on the world of art in Italy at the time and died in Rome in 1455. In 1982 he was beatified by Pope John Paul II and is now recognised as the patron saint of artists. Fra Angelico was a bookmark in history. Things changed at this time for artists and culture in general. We came out of the middle ages and science began to emerge as a wave of questioning and intellectual freedom swept Europe and a wealthy merchant class encouraged the patronage of the arts. They did this to encourage commerce within the trading centres where they lived. Huge amounts of money were offered to artists and artisans at the time to permanently enrich cities such as Florence in order to attract other traders and their clients. Much like Paris, to this day, Florence continues to be enriched by the heritage which those merchants left behind. Today, Dubai, in the United Arab Emirates is in the process of creating a similar heritage which will enrich future generations. What changed in art at the time of Fra Angelico was the manner and medium of representing religious images. Oil paint was migrating from Northern Europe to Italy and replacing the more labour intensive and restrictive media of egg tempera. Not only could artists work with more freedom but they could represent light, through colour, in a richer manner. Something else happened at this time . Artists began to draw in a more realistic manner. It was, as some suggest, the use of mirrors and lens which brought this about. However, not directly because these were the closely guarded secrets of the Dutch artists and would not become known in Italy for some time. The fact that some Dutch artists had been using these methods and Italian patrons had begun collecting their art, raised the bar, on expectations for the quality of the art, which they commissioned. Eventully the secrets of the use of lens and mirrors would arrive in Italy too. Before that, a greater emphasis on the ability to draw and represent concepts in a beautiful and realistic manner grew out of the aspirations created by Dutch art. Scientific methods began to be used. Understanding of perspective were further developed by artists and utilized in their works. New chemistry arrived and techniques which allowed paintings to last a very long time were employed. Fra Angelico was a master of this. His pure mind, ability to create beautiful compositions as well as his understanding of the painting media, allowed him to make a mark which still communicates to us today. His works are dramatically different to those of his fellow artists and the way he has represented people, saints and angels as well as his marvelous compositions, symbology, use of colour and gold are even now, inspiring to all artists and collectors. The exhibition is well worth visiting and is beautifully curated, as usual, in the musée Jacquemart-Andre. As a side note, for Irish visitors, there are three panels from the Irish, National Gallery of Art, in the Paris exhibition. Last night (November 3rd) I had the pleasure to attend the Vernissage of the Salon du Patrimoine, in the Carrousel du Louvre in Paris. If you are interested in french culture, quality craftsmanship, painting (in the craft sense), art restoration, restoration of buildings, or just want to get a real sense of how enormously motivated the french are to preserve their historical roots, then visit the Salon du Patrimoine. It's a blend of high tech and traditional crafts, usually blending seamlessly together in ways that are very surprising. The salon takes place annually in the Carrousel du Louvre, just beside the upturned pyramid. The dates this year, are from the 3 - 6th of November. You will meet extremely helpful and friendly french people with exacting knowledge of their specialisation. A picture tells a thousand words so here are a few to give you an idea of what it's like. Quality oozes out of everything. Very impresive reproduction carpentry everywhere although that's not the issue here. They are displaying handmade, individually designed, objet d'art and jewellery boxs. The school where I studied Trompe L'Oeil and faux effects are there. They are based in Montmarte. Stand K1, if you are visiting. Say hi to Thimy or Pierre, for me.